The reason for the hurry was that their house in London sold far more quickly than they thought it might. They loved where they were living, but as the family grew it was bursting at the seams. The property was in good condition, but the Gavins still wanted to make their mark on it straightaway. ‘We arrived with boxes and boxes full of books. Peter, in particular, is a great reader and there were no bookcases anywhere in the house, so we’ve added them all over the place,’ says Christie. They enlisted the help of a local carpenter, who initially added a wall of bookshelves in the hall as well as shelves either side of the fireplace in the dining room. That was one problem easily remedied. Deciding how to get a playroom and more bathrooms into the property needed more thought and planning. The end of the farmhouse had an open-fronted barn attached, with a large room on top. ‘Apparently, the farmer originally kept his tractors below but had a ballroom above. Some sort of folie de grandeur, I guess.’ Christie and Peter enlisted the help of local architect Roderick James, who drew up plans to make the most of the height of the upper room to design a green oak ceiling structure, which has been left exposed to retain a barn-like feel for their bedroom. At the far end of the space, an en suite bathroom was created and at the other end, next to the guest bedroom, a guest bathroom was added. With these major alterations in place, Christie could get on with redecorating the house to their taste. ‘When we moved in, most of the walls were cream and white and everywhere had a rose-coloured fitted carpet. 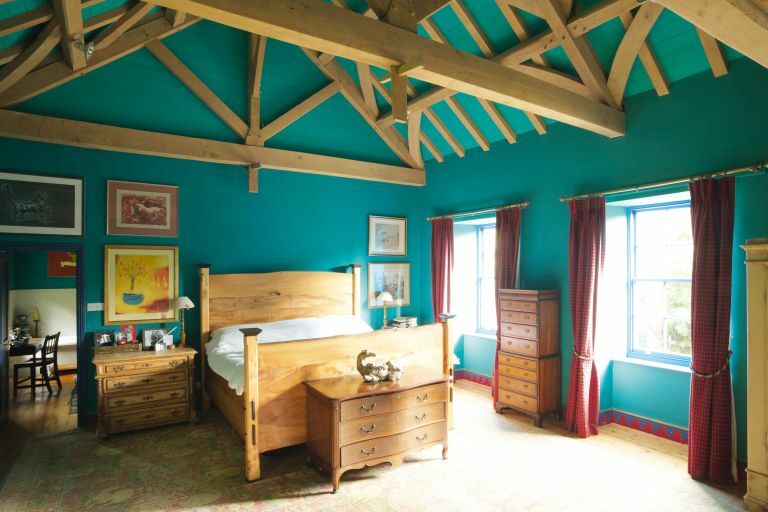 The strongly coloured walls – many based on colours that the couple enjoyed in their former home – also make a good backdrop for the large and varied collection of prints and paintings displayed throughout the house. ‘I’ve been collecting since I was a teenager. And Peter and I have been buying together for a long time, too, as well as inheriting them over the years,’ says Christie. The furniture also came with them, and has been added to as both Christie and Peter have inherited pieces from their parents. ‘We sometimes joke that the only reason we had our large bedroom built was so we had somewhere to put the beautiful carpet that once belonged to my mother,’ she says. Despite knowing no one when they bought the house, the Gavins quickly made friends and now they can’t imagine living anywhere else. The sailing that first brought them here remains a constant enjoyment, as does that initial feeling of anticipation as they approach the house down the leafy lane.